PDUAC3U Series 3 phase AC power distribution units accept a 3-phase input and provide single phase outputs that are distributed from the phases to ensure load babance on the source. They provide AC distribution and overload protection for up to 12 load circuits distributed through field wireable terminal blocks. There are 3 basic configurations operating from nominal 120VAC, 208VAC or 230VAC outputs respectively. Each of these is available with either 4, 8 or 12 2-pole load circuit breakers rated at 25A. 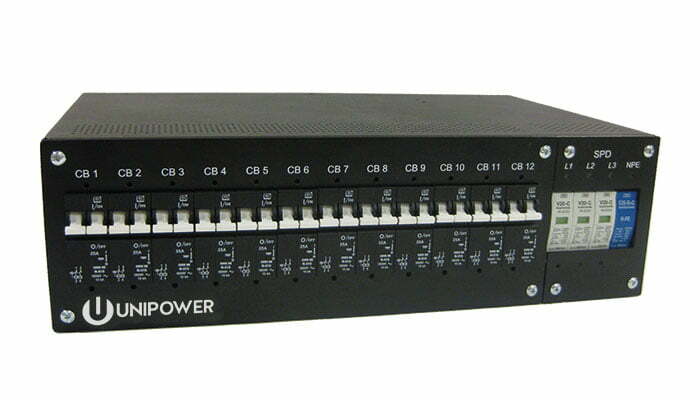 Model with and without input surge protection are available. These panels are only 3RU high and are supplied with brackets that allow mounting in a 19” frame. They are incorporated into several of the pre-configured systems. Connections Input (L1, L2, L3, N, GND): Cable Compression, #2AWG max. Safety UL60950-1, CSA22.2 No. 60950-1 2nd Ed., .EN60950-1 2nd Ed. 1. Alternative ratings are available, consult factory.